This is the latest updates that just received about Rip Curl, an Australia’s leading surfwear and lifestyle brand, has relocated from Sunway Pyramid’s old wing to a bigger space in the mall’s New Wing. Great to know that, their new store concept adapt eco-friendly interior by using recycled materials for the entire store 1,528 sq feet decoration and using recycled paper bags to customers. Rip Curl Malaysia sourced the recycle materials like old wood and metal pipes from areas in and surrounding Klang Valley. These were then used to build wall panels, changing rooms, and display cabinets in the new Sunway Pyramid Rip Curl store. Rip Curl’s Sunway Pyramid outlet offers a different, more comfortable shopping experience for beach and surf wear. 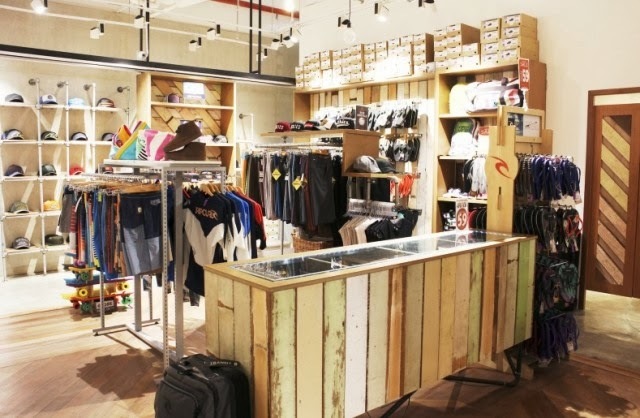 By the way, Rip Curl Sunway Pyramid also carries the following brands in its store such as Dickies, The Official Brand, Zephyr, Sprayground and Globe Skateboards.